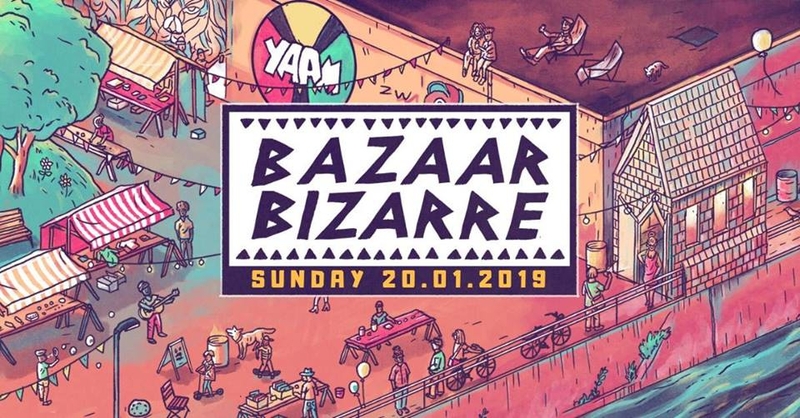 Bazaar Bizarre is back, every 3rd Sunday of the month! YAAM has always been a place of community and joining forces. With the Bazaar Bizarre we want to create a parallel universe for all to get together and enjoy a relaxed Sunday. We're bringing together what belongs together, a chilled atmosphere, tasty food, new and secondhand goods as well as some juicy records to dig through all in a warm and cozy atmosphere topped off with a Concert at the end of the day! Come around, enjoy a drink, roam through the Flea Market listening to your favourite tunes, rest your feet in our chill out area or test your new found dancing shoes just seconds after you bought them. Find new handmade goods from around the globe and treat yourself and friends to some tasty Food and good vibes. The Culture program consists out of selected Workshops & Performances, Djs and Concerts all to sweeten your Sunday delight! The Market will host stands for Vegetarian Food, Vinyl and Music Items, the best Second Hand has to offer, Arts and illustrations as well as Handmade goods and crafts.